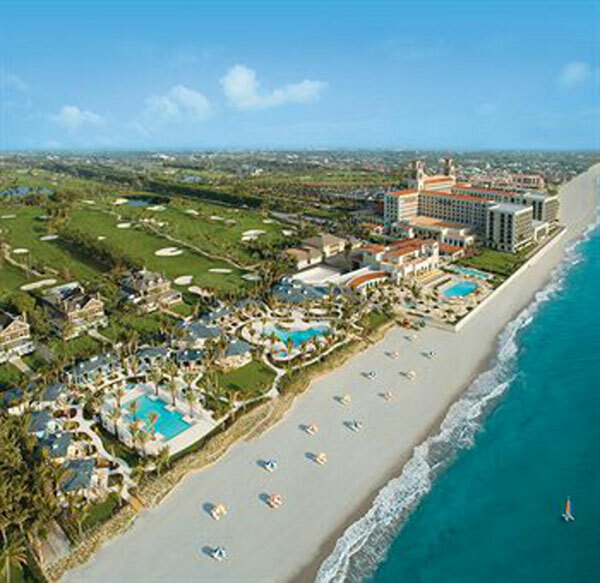 Florida is world famous for its white sandy beaches, as seen in Figures 1 and 2 which respectively show a portion of Fort Lauderdale Beach in Broward County and part of the beach at the Breakers Hotel in Palm Beach County. Many if not most of the beaches in southeast Florida have been renourished. That is, they are man-made beaches that are periodically replenished with sand dredged from the floor of the ocean. In spite of the fact that most beachgoers are unaware that many Florida beaches are artificial, even more people do not realize that the barrier islands along the southeast Florida shore are man-made coastal features, much larger and more imposing than the beach itself. The notion that beaches are artificial may not be that big of a surprise, especially to those beachgoers who have seen ocean dredges at work pumping sand onto the beach from the seafloor. The reason most folks are not aware of artificial barrier islands is that they were formed when artificial inlets were cut in the 1920s. What follows is the interesting story of how this happened. In fact, what we see today is the unintended result of this inlet cutting that occurred many decades ago; a process that changed the face of the southeast Florida coast forever. These artificial barrier islands are not true barrier islands at all, but the result of these coastal engineering efforts. The central and northern Atlantic coasts of Florida are commonly depicted as a chain of barrier islands (Figure 3) that are separated by capes and headlands (e.g. Cape Canaveral). In contrast to this coastal depiction and perhaps surprisingly, as described below, the southern coast is mainly mainland and keys. The transition from barrier islands to mainland occurs near Palm Beach whereas the transition to keys takes place at Miami (Key Biscayne, the northernmost key). So what happens in between, from northern Palm Beach to Miami? This stretch of coast is not insignificant when one considers that about five million people live on this man-modified shore (e.g. Finkl and Makowski, 2013). The geomorphological processes associated with barrier island systems are different from those of mainland coasts, and require a closer look. The distinction is important because the coastal frameworks of barrier islands, mainland shores, and keys develop their own sets of morphodynamic processes that respond differently to coastal resource management. Barrier islands, for example, are formed and maintained by such processes as island lowering and thinning, washover, rollover, and migration (e.g. Masselink, Hughes, and Knight, 2011; Pilkey 2003; Pilkey et al., 2011). 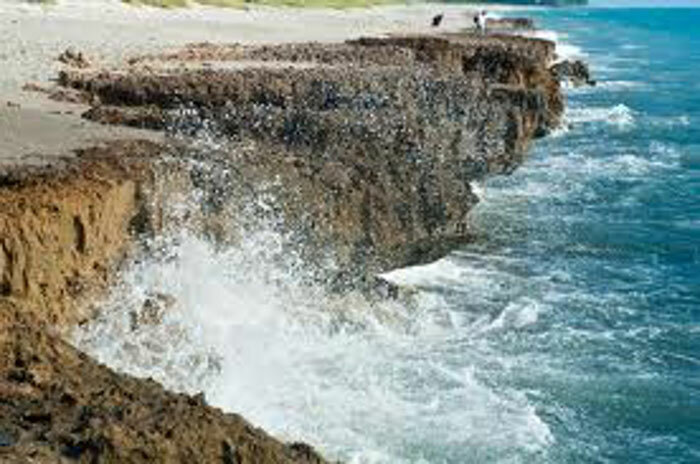 Mainland coasts and keys are stabilized by bedrock; they are susceptible to inundation and erosion, but do not rollover or migrate like natural barrier islands. It is fair to ask how barrier islands are defined and how are they separated from concepts of mainland. The question is not rhetorical, theoretical, or academic and answers may be obtained without resorting to the points of view of those with opposing arguments, even though they may be persuasive in their opinions. As we are not interested in opinions, or legal and administrative (jurisdictional) definitions, the scientific facts will suffice to draw some conclusions that may contradict popular conceptions. But, before we can consider characteristics of barrier islands, it is perhaps worthwhile to briefly review the geomorphological setting of the southeast Florida coastal environment. The coastal configuration of southeast Florida is controlled by the underlying bedrock (e.g. Banks et al., 2007; Banks et al., 2008; Finkl and Banks, 2010; Hoffmeister and Multer, 1968). Several studies (Finkl and Warner, 2005; Finkl and Andrews, 2008 Lovejoy, 1983, and Precht and Miller, 2007) report that local exposures of bedrock formations (i.e. Miami Oolite, Key Largo Limestone, Miami Limestone, late Pleistocene coral reefs, and the Anastasia Formation), (see Banks et al., 2007; Hine, 2009; Randazzo and Halley, 1997), provided bedrock control of seafloor morphology and shoreline position. Finkl and Warner (2005) specifically showed how the geomorphological configuration of the present-day southeast Florida shoreline in relation to the continental shelf was ultimately influenced by pre-Holocene bedrock structural transitions. Banks (1999), Finkl (1993), and Finkl and Andrews (2008) also showed how depressions in the bedrock provided accommodation space for marine sediments between shore-parallel lithified paleoshorelines (now drowned offshore or buried onshore by Recent sediments) (Lovejoy, 1983). Small rocky ridges along the shelf break, with up to 10 m vertical relief, mark positions of paleoshorelines that were referred to as “prominent sonic horizons” in the seismic reflection profile surveys conducted by Duane and Meisburger (1969a). Numerous lower-relief, shore-parallel ridges, separated by depressions, occur shoreward across the shelf. The depressions between the rock outcrops contain marine sediments that have accumulated to 15 m in thickness, forming a series of linear step-like inter-reefal sand flats between paleoshorelines (Banks et al., 2008; Duane and Meisburger, 1969a, 1969b; Finkl, 1993; and Finkl, Andrews, and Benedet, 2003). The inter-reefal sand flats contain calcarous sands, limestone gravels, coral fragments, and intercalated clays and slits (DaPrato and Finkl, 1994). Gorsline (1963) and Macintyre and Milliman (1969; 1970) previously showed that continental shelf sediments in this area contain an oolitic component along the seaward side of the reefs with concentrations of planktonic Formainifera and pteropod shell remnants on the descending slope of the continent slope. The relict rocky ridge coral reef facies surrounding these inter-reefal flats rise up from the underlying bedrock to form the Florida Reef Tract (FRT) (Macintyre, 1988, and Moyer et al., 2003). Studies of the FRT (e.g., Agassiz, 1852; Lidz et al., 1991a, 1991b; Hoffmeister and Multer, 1968; Murdoch and Aronson, 1999; Precht and Miller, 2007; Shinn, 1963) describe a shelf-edge coral reef system that extends 260 km alongshore, which becomes most extensively developed offshore of the Florida Keys. Today’s so-called ‘barrier islands’ parallel the offshore coral reefs and linear exposures of bedrock on the seafloor. As described below, coastal sediments (shoreface, beach, dune, and marsh sediments) have accumulated on top of landward extensions of these bedrock highs. This is the backdrop to the man-made barrier island setting. At first glance, the coastal plain barrier islands of southeast Florida appear to meet the formational requirements laid out by Pilkey (2003) and Swift et al. (1985): a rising sea level, a gently sloping mainland surface, a supply of sand, energetic waves, and a low to intermediate tidal range. The brief comments here are not a story about island genesis (see discussion in Pilkey, 2003), but rather an explanation of how the ‘barrier islands’ of southeast Florida were man-made. The interesting point is that the Holocene evolution of the coast did produce, according to the criteria listed above, barriers. Although some may have been barrier islands, most appear to have been barrier spits connected to the mainland as evidenced from early aerial photography. 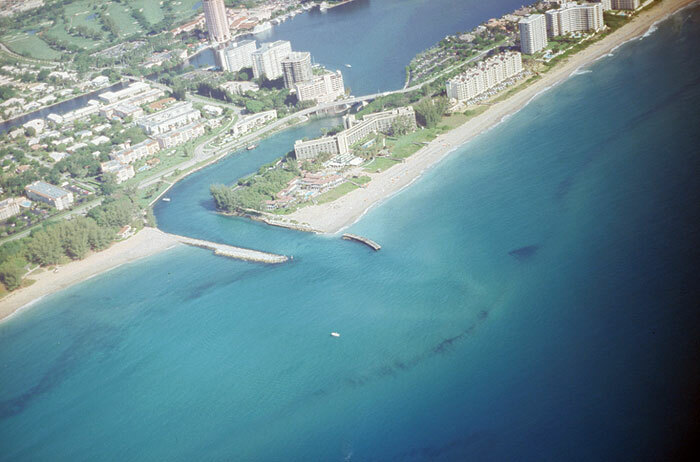 Figure 4 is an oblique aerial photograph (looking from the southeast towards the northwest across the shore) of Lake Mabel that was eventually turned into Port Everglades. Comparison with Figures 5 and 6, modern views of the coast, shows the extent of coastal modification that took place with urban-industrial development along the shore and in coastal wetlands. Going back to Figure 4 (circa 1925), note the jetties at the New River inlet to the north (upper right hand corner of photo) (now closed). The spit originally extended southwards past Lake Mable to the town of Dania Beach, some 9 km down coast. The intact barrier beach – dune system, clearly visible in the lower left corner of the photo, has now become a true barrier island due to beheading by inlet cutting. The upper or northern part of the barrier has already been destabilized by the stabilization of the New River inlet. Because the barrier was starved of its alongshore sediment supply, it became unstable and migrated shoreward becoming welded to the mainland. By 1935, the process was essentially complete and the remaining portion of the barrier island (formerly a barrier spit) had become welded to the mainland. At this time what remains is a mainland coast. But, this is not the end of the story. At about the same time, the Intracoastal Waterway (ICWW) was being dredged through freshwater marsh at variable distances inland from the shore. These marshlands were part of the Florida Everglades that nearly reached the coast (Finkl and Restrepo, 2007). 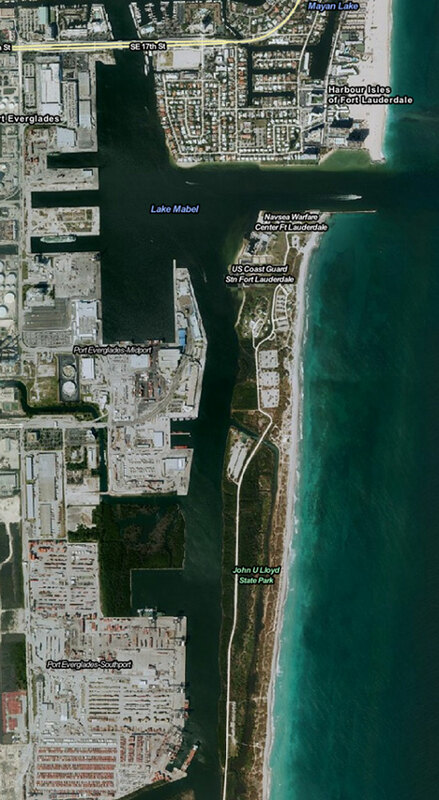 Comparison of Figures 4, 5, and 6 shows the location of the ICWW that is more or less parallel to the shore and which lines up with the natural waterway on the north side of Lake Mabel (now the turning basin of Port Everglades, a major cruise ship, container, and petroleum port). 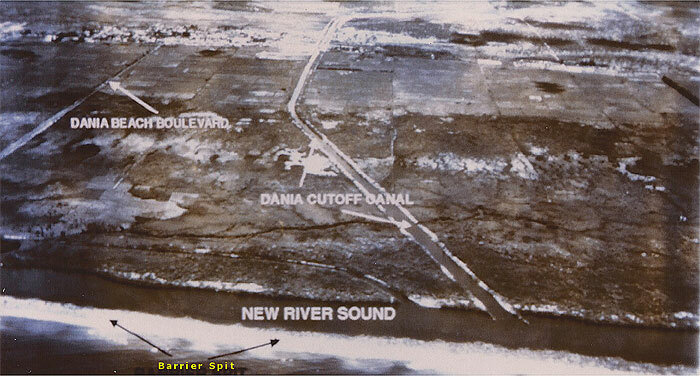 By 1935, the ICWW was completed along this section of coast and a new, modified biophysical setting had been created by inlet dredging, harbor development, and dredge and fill operations. This setting thus appeared to show a shore (beach-dune system) that was backed by wetlands that were cut by man-made canals. The land area between the shore and the ICWW was gradually referred to as the ‘barrier island’ (Finkl, 1993). The true barrier spits and islands, from a geological point of view, had long disappeared and this strip of land thus became known as the barrier island. 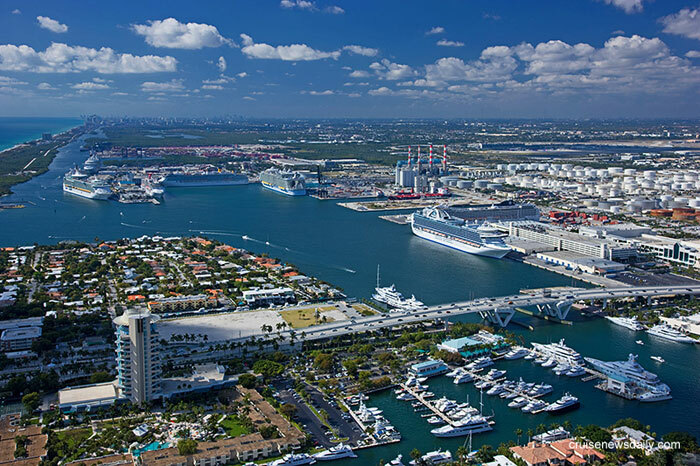 The process of inlet dredging and stabilization along with construction of the ICWW continued all along the Florida east coast, southwards to Miami and northwards up the coast past Palm Beach and further. When Is a Barrier Island a Barrier Island? Such a question to average beachgoers may seem inconsequential and without merit for further consideration as a beach is a beach. Or is it? As we know from global studies of beach morphodynamics, there are many different kinds of beaches from both a process and morphology (shape) point of view (e.g. Benedet, Finkl and Klein, 2004; Finkl, 2004; Short, 1999; Davis and FitzGerald, 2004). Beaches are also different in terms of composition and grain size as well as geographic positions from tropical low latitudes to high polar zones. Beaches can be very different and so can barrier islands. Pilkey (2003), for example, has summarized the main types of barrier islands as Arctic, bay mouth, sandur, composite, accidental, man-made, and lagoon barrier islands. Barrier islands thus occur in a wide range of environments and beaches are normally associated with them. In the case of these examples from Florida, it is interesting to note that the land area between the shore and the ICWW is treated as a barrier island by the State of Florida for administrative purposes. Jurisdictional or not, this has nothing to do with the geological perspective of barrier islands. The case is interesting because the designation of ‘barrier island’ carries connotations as to modes of formational development, use, protection, hazards, and management. The political or managerial point of view is divergent from the geological facts because we now know the pathway of historical evolution for these coastal strips of land. Most barrier islands are composed of unconsolidated sediments that rest unconformably on a variety of substrates, as seen for example in the Carolinas and elsewhere when a barrier migrates shoreward and overrides marsh sediments. The Florida east coast so-called barrier islands are rock cored and cannot migrate. 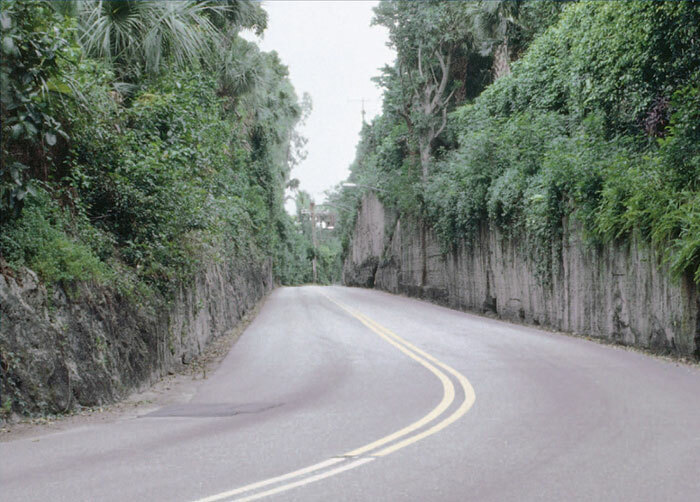 Rather spectacular examples of the rock core is seen in the 15-m deep road cut thru the Anastasia Formation (Lovejoy, 1983) on the island of Palm Beach (Figure 7), or the rocky coastal cliffs at Blowing Rocks Preserve (Tequesta) on Jupiter Island (Figure 8). On the shore, the Anastasia Formation is characteristic of a wave-erosion coast with notches forming at the bottom of sea cliffs. There are often small sea caves and most cliffs have a wave abrasion platform at the base, which is often covered with sand. Small sea arches occur at the base of promontories that jut into the ocean making for a very interesting seascape. With an age of about 130,000 years old, the Anastasia Formation is the youngest lithified (solid rock) marine deposit found along Florida’s coast. It was formed during what scientists call the Marine Isotope Stage 5 (MIS 5e) when sea level during an Interglacial time was a few meters higher than today. In addition to occurring on land and along the shore, the Anastasia Formation also occurs offshore on the continental shelf where it forms exposed bedrock surfaces that serves as a template for geomorphological development of seafloor features such as structural sand flats and interesting reticulated patterns (Finkl, Benedet and Andrews, 2005). The rocky nature of the shore is also illustrated in Figures 9 and 10 where rock outcrops of the Anastasia Formation form structural sand flats and more or less flat bedrock surfaces that are clearly visible in the nearshore at the South Lake Worth (Boynton) Inlet and at the Boca Raton Inlet, respectively. Both figures show former shoreline positions associated with bedrock highs on the south or downdrift sides of the stabilized inlets. The exposed bedrock is darker colored than the lighter colored surrounding sand on the seafloor. Inspection of the shore along the southeast coast shows that the beaches are perched on top of limestone bedrock (Miami Limestone or the Anastasia Formation). Note the dramatically perched beach in Figure 8 as an extreme example. 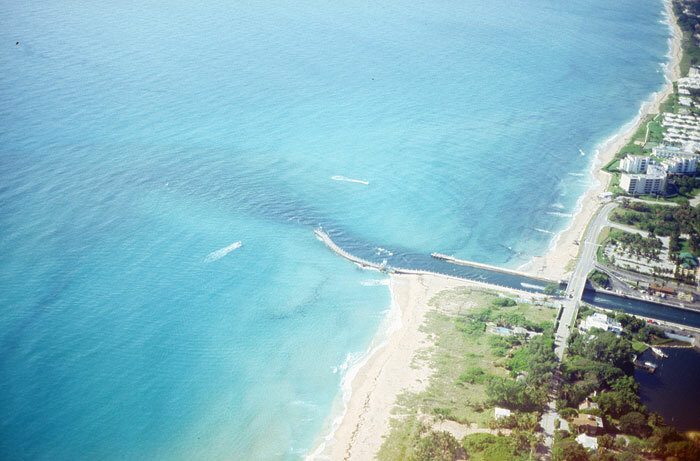 Prior to the late 1970s (Miami Beach was first renourished in 1977), native beaches typically had about 2 m of sand over the limestone bedrock (based on beach probe studies by the author), but now most beaches have been artificially renourished by dredging sand from the seafloor increasing the thickness of berms that in turn gives a false impression of this coast’s sand-worthiness. The Florida southeast coast beaches are in fact sand starved, and must be periodically renourished so that the shallowly underlying limestone bedrock is not exposed by erosion to produce a rocky shore. This would be bad for tourism and consequently enormous amounts of money are spent to maintain the appearance of natural beaches. From a bureaucratic point of view the southeast coast is regarded as a barrier island and the beaches as barrier island beaches. This regulatory definition is in sharp contrast to a geological point of view that relies on coastal configuration, morphology, and coastal dynamics that define this as a mainland shore. The barrier spits and barrier islands have long ago disappeared (cf. Figure 4)> at the hands of coastal engineering efforts to cut and stabilize inlets. The beaches, whether designated as barrier island beaches or mainland beaches, are still beautiful and constitute major tourist attractions. Although most beachgoers do not know the difference between a barrier island or a mainland beach along the southeast coast because of misinformation, for all intent and purposes the beaches look great but do not function as a true barrier-island beach. And because most beaches are artificially renourished and the so-called barrier islands are engineered, the southeast coast of Florida is a good example of an artificial or man-made coast. It is replete with artificial beaches and man-made barrier islands. Although not specifically studied by the author, it is suspected that the central and northern Florida coasts may also be lithologically controlled but construed as true barrier islands. The misidentification of a man-made barrier island coast for a mainland coast may seem like a moot point or a trivial matter, but this is not so because managerial procedures appropriate for natural barrier islands and beaches cannot be applied to man-made coasts. Neither barrier island rollover is physically possible, nor are other natural processes such back stepping or regression, when the ‘barrier’ is rock cored. Beach erosion is a problem along the southeast coast, as in many other areas, but erosion over the short term can only erode beach and dune sand back to bedrock. The problem is, however, exacerbated by construction too close to the shore. Erosion of the rocky cliffs takes place over the long term and is not an urgent problem. One might have thought, however, that the presence of rocky shores does not match the definition of a barrier island composed of unconsolidated sediments. Nonetheless, with the present situation of misidentification of the present shoreline there exist numerous implications for proper management of these coastal segments. What’s in a Name or Does a Name Matter? In order for speech or writing to be intelligible to others, beliefs about the word must largely cohere. The term barrier island has specific meaning to geologists, but when the term is misapplied because of incomplete understanding or misidentification of landforms or types of coastal systems, it is a disservice to the public and scientific community. 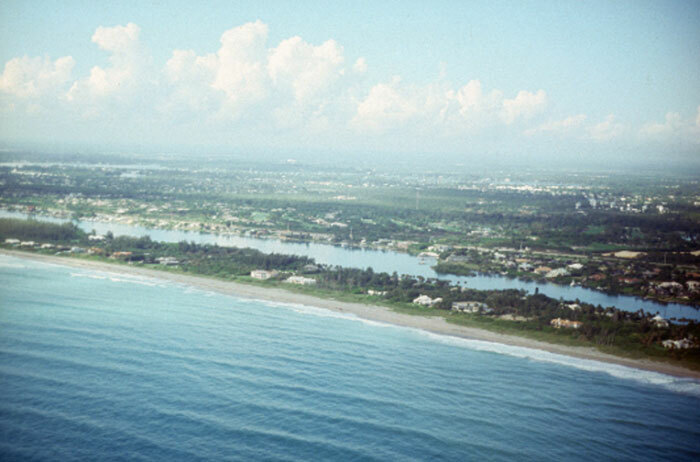 In the example of southeast Florida we see that natural barrier islands and spits became welded to the mainland shore as a consequence of engineering works. The mainland shore today is fixed by limestone bedrock and the land area between the ocean and ICWW does not constitute a (natural) barrier island in the traditional sense of the word (see Swift et al., 1985) because it is rock cored. This technical clarification does not, however, detract from the beauty or allure of south Florida’s perched beaches that are artificially maintained on what we now clearly recognize as man-made barrier islands. Tourists and beachgoers can enjoy them just as before, but now with a more informed view of reality. One would hope that politicos and natural resource managers come to appreciate the significance and importance of scientific and technical terminology. Words have meaning and their application or misapplication has consequences in the real world. We should not be indifferent to the truth because misidentification of geologic features by application of incorrect terminology leaves researchers unequipped to distinguish truth from falsity in matters that most concern them. Agassiz, L. (1852). Annual report of the Superintendent of the Coast Survey, showing the progress of that work during the year ending November, 1851. Robert Armstrong, Washington, 107–134. Banks, K.W. (1999). Analysis of modern carbonate sediments: Lubber’s Bank, Abaco, Bahamas. Thesis submitted in partial fulfillment for the Degree of Master of Science, Florida Atlantic University, 103pp. Banks, K.W., Riegl, B.M., Richards, V.P., Walker, B.K., Helmle, K.P., Jordan, L.K.B., Phipps, J., Shivji, M.S., Spieler, R.E., & Dodge, R.E. (2008). The reef tract of continental southeast Florida (Miami-Dade, Broward, and Palm Beach counties, U.S.A.). In: Riegl & Dodge (eds. ), Coral Reefs of the USA, 175-220. Banks, K.W., Riegl, B.M., Shinn, E.A., Piller, W.E., & Dodge, R.E. (2007). Geomorphology of the southeast Florida continental reef tract (Miami-Dade, Broward, and Palm Beach Counties, USA). Coral Reefs, 26, 617-633. Benedet, L., Finkl, C.W., & Klein, A.H.F. (2004). Morphodynamic Classification of Beaches on the Atlantic Coast of Florida: Geographical Variability of Beach Types, Beach Safety, and Coastal Hazards. Journal of Coastal Research, Special Issue No. 39, pp. 360-365. DaPrato, G.W. and Finkl, C.W. (1994). Applications of a layered classification approach, based on spatial primitives obtained from TM data from Southern Florida, for the analysis of turbid marine waters using fuzzy sets. International Archives of Photogrammetry and Remote Sensing, 30(4), 69-76. Davis, R.A. and FitzGerald, D.M. (2004). Beaches and Coasts. Malden, Massachusetts: Blackwell, 419p. Duane, D.B., & Meisburger, E.P. (1969a). Geomorphology and sediments of the nearshore continental shelf Miami to Palm Beach, Florida. U.S. Army Corps of Engineers, CERC Technical Memorandum 29, 47p. Duane, D.B., & Meisburger, E.P. (1969b). Geomorphology and sediments of the inner continental shelf, Palm Beach to Cape Kennedy, Florida. U.S. Army Corps of Engineers, CERC Technical Memorandum 34. Finkl, C.W. (1993). Pre-emptive strategies for enhanced sand bypassing and beach replenishment activities: a geological perspective. Journal of Coastal Research, SI(18), 59–89. Finkl, C.W. (2004). Coastal classification: Systematic approaches to consider in the development of a comprehensive scheme. Journal of Coastal Research, 20(1), 166-213. Finkl, C.W. and Makowski, C. (2013). The southeast Florida coastal zone (SFCZ): A cascade of natural, biological, and human-induced hazards. In: Finkl, C.W. (ed. ), Coastal Hazards. Dordrecht, The Netherlands: Springer, pp. 3-56. Finkl, C.W. and Restrepo-Coupe, N. (2007). Potential natural environments based on pedological properties in the coastal conurbation of subtropical southeast Florida. Journal of Coastal Research, 23(2), 317-349. Finkl, C.W., Benedet, L., & Andrews, J.L. (2005). Submarine geomorphology of the continental shelf off southeast Florida based on interpretation of airborne laser bathymetry. Journal of Coastal Research, 21(6), 1178–1190. Finkl, C.W., & Andrews, J.L. (2008). Shelf geomorphology along the southeast Florida Atlantic continental platform: Barrier coral reefs, nearshore bedrock, and morphosedimentary features. Journal of Coastal Research, 24(4), 823-849. [see note on page 2 where its listed as 2009 rather than 2008. Finkl, C.W., Andrews, J., & Benedet, L. (2003). Shelf sand searches for beach renourishment along Florida Gulf and Atlantic coasts based on geological, geomorphological, and geotechnical principles and practices. Proceedings of Coastal Sediments ’03 (Clearwater, Florida). Reston, Virginia: American Society of Civil Engineers, CD-ROM. Finkl, C.W., & Banks, K.W. (2010). Mapping seafloor topography based on interpretation of airborne laser bathymetry: Examples from the southeast Florida Atlantic continental shelf. In: Martorino & Puopolo (eds.) New Oceanography Research Developments: Marine Chemistry, Ocean Floor Analyses, and Marine Phytoplankton. Nova Science Publishers: New York, pp 163–187. Finkl, C.W., & Warner, M.T. (2005). Morphological features and morphological zones along the inner continental shelf of southeastern Florida: An example of form and process controlled by lithology. Journal of Coastal Research, SI(42), 79-96. Gorsline, D.S. (1963). Bottom sediments of the Atlantic shelf and slope off the southern United States. The Journal of Geology, 71(4), 422-440. Hine, A.C. (2009). The Geology of Florida. Florence, Kentucky: Cengage Learning Custom Solutions, 30p. Hoffmeister, J.E., & Multer, L.G. (1968). Geology and Origin of the Florida Keys. Ecological Society of America Bulletin, 79, 1487-1502. Lidz, B.H., Hine, A.C., & Shinn, E.A. (1991a). Multiple outlier-reef systems off a carbonate platform: a new type of windward margin (South Florida). American Association Petroleum Geologists Bulletin,75(3), 621. Lidz, B.H., Hine, A.C., Shinn, E.A., & Kindinger, J.L. (1991b). Multiple outer-reef tracts along the South Florida bank margin: Outlier reefs, a new windward-margin model. Geology, 19, 115-118. Lovejoy, D.W. (1983). The Anastasia Formation in Palm Beach and Martin Counties, Florida. Miami Geological Society Memoir 3, pp. 58–72. MacIntyre, I.G. (1988). Modern coral reefs of western Atlantic: new geological perspective. American Association of Petroleum Geology, Bulletin 72, 1360–1369. MacIntyre, I.G., & Milliman, J.D. (1969). Ridge-like features on the outer shelf and upper slope, continental margin, southeastern United States. Geological Society of America, Special Paper 121, 184-185. MacIntyre, I.G., & Milliman, J.D. (1970). Physiographic features on the outer shelf and upper slope, Atlantic continental margin, southeastern United States. Geological Society of America, Bulletin 81, 2577-2598. Masselselink, G., Hughes, M.G., & Knight, J. (2011). Introduction to Coastal Processes and Geomorphology. London: Arnold. Moyer, R.P., Riegl, B., Banks, K., & Dodge, R.E. (2003). Spatial patterns and ecology of benthic communities on a high-latitude south Florida (Broward County, USA) reef system. Coral Reefs, 22, 447-464. Murdoch, T.J.T., & Aronson, R.B. (1999). Scale-dependent spatial variability of coral assemblages along the Florida Reef Tract. Coral Reefs, 18, 341-351. Pilkey, O.H. (2003). A Celebration of the World’s Barrier Islands. New York : Columbia University, 309p. Pilkey, O.H., Neal, W.J., Kelley, J.T., & Cooper, A.G. (2011). The World’s Beaches. Berkeley, California: University of California Press, 283p. Precht, W.F., & Miller, S.L. (2007). Ecological Shifts along the Florida Reef Tract. In: Geological Approaches to Coral Reef Ecology (pp. 237-312). Springer: New York. Randazzo, A.F. and Halley, R.B. (1997). Geology of the Florida Keys. In: Randazzo, A.F. and Jones, D.S., eds., The Geology of Florida, University Press of Florida, Gainesville, Florida, p. 251-260. Shinn, E. (1963). Spur and groove formation on the Florida Reef Tract. Journal of Sedimentary Research, 33(2), 291-303. Short, A.D. (1999). Handbook of Beach and Shoreface Morphodyanmics. Chichester: Wiley, 379p. Swift, D.J.P., Niederoda, A.W., Vincent, C.E., & Hopkins, T.S. (1985). Barrier island evolution, Middle Atlantic Shelf, U.S.A. Part I: shoreface dynamics. Marine Geology, 63, 331-361.